eVoice was founded in 2000. Since their start, they have strived to offer efficient, professional calling plans that give companies more options. They are powered by j2 Global and were cited as the “Best Voicemail Management Service” by Inc. Magazine. They offer multiple lines, extensions and a long list of included features for small businesses and professionals. eVoice offers small business plans that include inbound faxes and VIP support. Minutes range from 300 to 4,000 depending on the company’s need and plans have competitive rates ranging from $12.99/mo to $79.99 per mo. There is no contract for the small business or professional plans. eVoice doesn’t shy away from features. Users have access to call management systems that make managing phone calls a lot easier. eVoice can also route calls based on rules – meaning a user can have calls directed to their business or home office through the Call Handling feature. Additional features include message forwarding, call waiting, caller ID, do not disturb settings, auto attendant and more. eVoice does give a lot of numbers and options for users. Small Business Plans have anywhere from 15 to 45 numbers as well as up to 15 extensions. Professional Plan users get up to 6 numbers and 2 extensions. Vanity numbers will cost you $30 and international numbers are available for an additional fee as well. Advanced features are offered to certain plans, including call recording, international numbers, outbound faxing and a live receptionist service. Video and web conferencing is also available, but only for specific plans and all at additional fees that are not readily available. The user platform is attractive and fairly easy to use, even if a customer is not used to VoIP services. But, because they offer so many features, users may be easily overwhelmed at all of the call rules and settings they must first go through to setup their account. eVoice offers a robust help and support guide online. They also report their system status and any current issues they may be working on through their Support page. Their “Getting Started” and other guides are very detailed, but the information is presented in a rather clunky way. Support is, however, available via email and phone 24/7 for those users who need additional assistance. Professional Plan: 300 minutes, 6 phone numbers and 2 extensions. Starting at $12.99 per month. Small Business 1000: 1,000 minutes, 15 phone numbers and 5 extensions. Starting at $29.99 per month. Small Business 2000: 2,000 minutes, 30 phone numbers, and 10 extensions. Starting at $49.99 per month. Small Business 4000: 4,000 minutes, 45 numbers and 15 extensions. Starting at $79.99 per month. All plans include Advanced Features and there are no contracts. An overage of 3.9 cents per minute is charged – but because there are no contracts, users can upgrade/downgrade minutes and plans at any time. 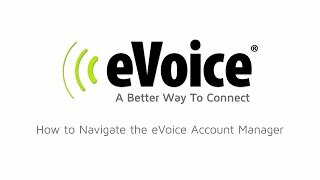 Full Features: eVoice users have access to a long list of included features, such as auto receptionist/attendant, call forwarding, blocking, call handling rules, call screening and routing, extensions, inbound fax, greetings, voicemail (online, mobile, email and transcribed), and more. The list of included features is very robust. Extensions and Numbers: They do make it easy for a small business to create a phone system. Some plans allow up to 45 separate numbers and 15 extensions. Even the Professional Plan offers six numbers and 2 extensions. No Contracts: Unlike some VoIP plans, eVoice does not require customers to have long, binding contracts. So, if a user decides they need to upgrade to a different plan or they want to cancel, they don’t have any harsh cancellation fees to worry about. Free Trial: eVoice allows users to try their Professional and Small Business plans for free for 30 days. Credit cards are not charged until the 30 days are up and users can cancel at any time during that 30 days to avoid charges. Call Routing: Users can route calls based on the rules they set up in the administrative panel. They can route calls to their office and have specific numbers automatically routed to their home office. Auto Receptionist: Most small business owners don’t have a receptionist, but eVoice makes it simple to not have one. Their automated receptionist allows greetings to welcome customers and then route their calls to the right extension so that a call is never missed again. 24/7 Support: eVoice does offer a 24/7 customer support line and email for all paid plan users. Premium Features Not Included: While eVoice does offer a lot of included features, the premium features (such as business texting, call recording, outbound faxing, international numbers, and web/video conferencing) are offered at an additional price – and that price is not readily advertised on their site. Professional Plans Have Limited Minutes: The professional plan offers only 300 minutes to share with up to six different lines and two extensions. While the price is fairly affordable, it is unlikely a professional will be able to use such a small plan. Clunky Help Guides: eVoice attempted to make an in-depth, thorough help guide system. While they certainly provide all of the information a user needs, it is clunky, difficult to navigate and the only effective way to find information is via a search bar. 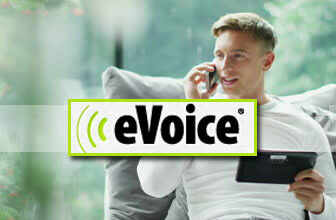 No Chat Support: eVoice is available 24/7, but they do not offer live chat support; therefore a user will have to wait on the phone or wait for a response via email. Storage: While an account is active, voicemails, faxes and text messages sent through an eVoice account are stored on their server for up to 30 days. However, eVoice reserves the right to change this policy at any time, which means a user could potentially lose saved messages out of nowhere. 911: Users are strictly prohibited from calling 9-1-1 on their eVoice lines. Late Fees: Instead of canceling service when a monthly payment is not received, eVoice will charge a $10 late fee – this includes if the account was only partially paid for the month. Poor BBB Rating: eVoice is tied to j2 Cloud Services, which has an F rating with the Better Business Bureau and is not BBB Accredited. While eVoice operates independently, they are still part of the j2 Cloud Services family; therefore, the overall poor rating still reflects on them. All plans include Advanced Features and there are no contracts. An overage of 3.9 cents per minute is charged - but because there are no contracts, users can upgrade/downgrade minutes and plans at any time.